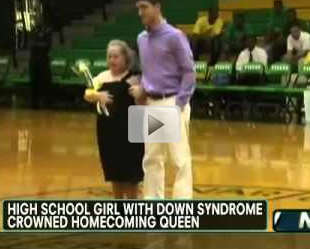 In Bolivar Tenn., one deserving girl, Kara Marcum, was voted Homecoming Queen. Kara has Down Syndrome but she doesn't let that stop her from overcoming her challenges and becoming the best and happiest person she can become. The students in Kara's high school recognized this determination and elected her to this great honor. They didn't vote for Kara because they felt sorry for her, they voted for her because of the amazing person she is and her continual smiles. This video is a news clip featuring this wonderful story. Watch here and see just how those around Kara admire her positive attitude.